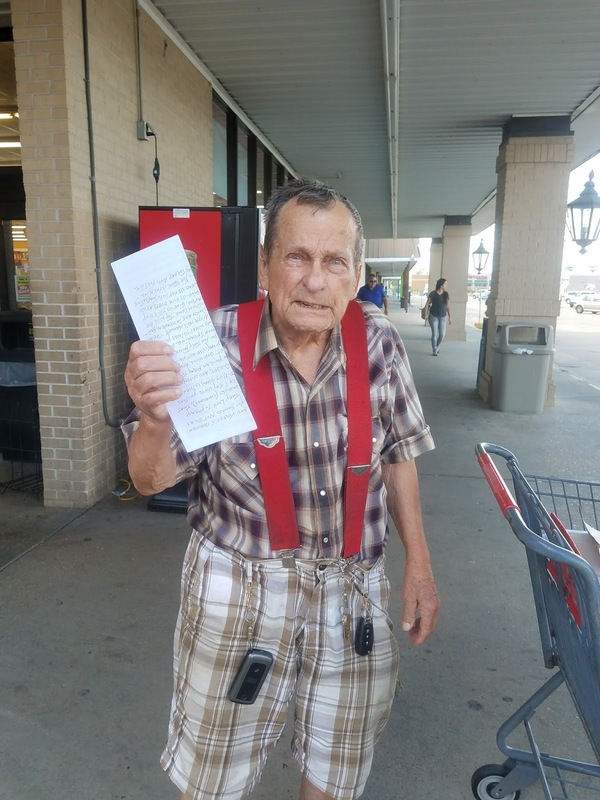 Fred was standing outside of Jerry Lee's handing out these handwritten tracts. I had to get his story. I asked him why he was standing outside the store handing out tracts and he said he can't help but share the gospel. It is like fire shut up in his bones. He said he used to be a gangster in Chicago up until his encounter with Jesus. God "knocked him out" and changed everything. Fred had a radical Encounter With Jesus Christ on December 25th, 1951. He said God 'knocked him out' and told him to get baptized and read his Bible. Fred has read the Bible hundreds of times since then. Fred is over 90 years old. When i was talking to him, he handed out probably 20-30 hand written (photocopied) tracts. Fred takes Jesus to the people.